Here we find another of those very popular “mini-books” (103 pages) aimed at those readers craving a powerful message via a short read. Who better to grant that request than author Spencer Johnson, who did exactly that in Who Moved the Cheese, The Present, and his solid contributions to the One Minute Manager series? More than 46 million copies of Spencer Johnson’s books are in print worldwide in more than 47 languages. The timing couldn’t be better for this story. If you’re a person who has been trying to survive or just make it during these tough times, this narrative may just provide that valuable clarity that you need right now. This tale focuses on a man who is struggling in his life. A friend tells him a story about another man in a similar situation. He lives unhappily in a valley until he meets an old man who lives on a peak. That meeting changes his work and life forever. Initially, the young man has no idea he is talking with one of the most peaceful and successful people in the world. However, through a series of conversations and experiences, the young man learns that peaks and valleys are all a part of life. The key to living a richer life is how you perceive and address the peaks and valleys and what you learn while you are traversing the peaks and valleys. He realizes he can use the old man’s remarkable principles and practical tools in good times and bad times to make a difference in his life. As a result he becomes more calm and successful and takes more control of his life. Understand and apply this wisdom to successfully navigate the peaks and valleys of your life at work and at home. Recognize and utilize the positive that is so often hidden in the bad times. Appreciate and capitalize on your good times. This book will provide you with the clarity to do just that. The author now follows up those terrific resources with 50 Prosperity Classics. I should again alert you to the fact that you more than likely will not find these titles on the shelves of your local book store but can certainly order them very easily from your favorite store or online from Amazon.com. This fourth book focuses on the great works on wealth, entrepreneurship, personal finance, investing, economics and philanthropy, providing guidance and encouragement to develop the millionaire mindset, become a wealth creator, make wise investment decisions and―once you’ve made it―give a little back. Butler-Bowdon follows the same reader-friendly format here that was so successful in his trilogy. I’ll explain that template here and then share the individual content under each title. Each classic has its own chapter which is reasonably short and to the point while extremely revealing. The first page of each chapter begins with a few notable quotes from the classic followed by a feature titled “In a nutshell.” This profile summarizes the entire classic in one or two sentences followed by another interesting feature, “In a similar vein,” which lists several other classics that address the same subject. Thus far–one page. The author then offers the main idea, context, and impact of the book itself followed by a short, interesting biography of the author. The author has organized his content into four elements for easier access to this reader-friendly material. Attract It: Master the inner game of wealth and abundance with books such as Rhonda Byrne’s bestselling The Secret, Charles Fillmore’s Prosperity, Napoleon Hill’s The Master Key to Riches. Create It: Learn from the secrets and strategies of wealth creators such as Richard Branson, Bill Gates, Conrad Hilton, Anita Roddick and Donald Trump. Manage It: Discover the nuts and bolts of personal finance and investing such as Benjamin Graham’s The Intelligent Investor, Suze Orman’s Women and Money, Dave Ramsey’s Financial Peace Revisited and Peter Lynch’s One Up on Wall Street. Share It: Understand the flow of wealth and how to give something back with inspiration from Andrew Carnegie’s The Gospel of Wealth, Paul Hawken’s Natural Capitalism and Lynne Twist’s The Soul of Money. This book is loaded with wisdom in the form of interesting quotes from some of the greatest minds in this area. The book concludes with five pages of “Prosperity Principles” and recommendations for 50 additional prosperity classics. The author of #1 international bestsellers The Tipping Point and Blink is a staff writer for The New Yorker and was formerly a business and science reporter at the Washington Post. Malcolm Gladwell’s one of the very few authors kind enough to consider his readers by offering a definition of his chosen title in the first paragraph of the book. I’ll do the same for you in my second paragraph. Out-li-er \ noun 1. something that is situated away from or classed differently from a main or related body 2. a statistical observation that is markedly different in value from the others of the sample. After reading several chapters, I found myself identifying outliers as those men and women with skills, talent, and drive who do things out of the ordinary. We’ve all known someone like this from school, work, church or the neighborhood. We knew them—we just didn’t always understand them or how they managed to reach such levels of performance so effortlessly. It left us wondering why some people succeed, living remarkably productive and impactful lives, while so many more never reach their potential? Challenging our cherished belief of the “self-made man,” he makes the democratic assertion that superstars don’t appear in their cribs as aggressive life changers ready to take on and conquer the challenges of the world as we know it. In this book the author continues to do what he does best—illuminating secret patterns behind everyday phenomena. He does so while sharing examples from every aspect of our lives. He asks the question: What makes high-achievers different? His answer is that we pay too much attention to what successful people are like and too little attention to where they are from: that is, their culture, their family, their generation, and the idiosyncratic experiences of their upbringing. Along the way he explains the secrets of software billionaires, what it takes to be a great soccer player, why Asians are good at math, and what made the Beatles the greatest rock band. Why most pro hockey players were born in January. How many hours of practice it takes to master a skill (10,000 hours). How a pilot’s culture impacts his/her crash record. What Bill Gates, the Beatles and Mozart had in common. Why the descendents of Jewish immigrant garment workers became the most powerful lawyers in New York. How a centuries-old culture of rice farming helps Asian kids master math. The reasons for school achievement gaps. Malcolm Gladwell expounds on how the world could benefit if more of our kids were granted the opportunities to fulfill their remarkable potential. Like his previous work, Outliers is a thought-provoking, category-defying book. It is also available in audio form read by the author. Referred to as a companion volume or owner’s manual to The Traveler’s Gift, this book is a refresher course and excellent follow-up fortifying the original message with letters from established “successes” who share their enthusiasm for the author’s revelations. Andrews provides stories, examples and revisions of the wording of his first book that helps extend the reader’s ability to incorporate Andrews’ ideas. The author provides you with an in-depth understanding of The Seven Decisions, exercises on how to integrate each, and authentic messages from celebrities, business leaders and athletes. The celebrity profiles include: Jimmy Dean, Bob Hope, Stan Lee, General Norman Schwarzkopf, Amy Grant, Norman Vincent Peale, and Joan Rivers. The Death Bed Exercise … Write a glowing, incredible eulogy that you would like to have read aloud at your funeral. Andrews also provides some key questions to encourage your creativity in this exercise. 24 Hours to Live … What would I like to do with the next 24 hours of my life? Several leading questions guide you to what might be a surprising answer. Others include Crafting Your Ultimate Vision, Harnessing Your Inner Circle, Capitalizing on Your Strengths and many more challenging exercises. The author certainly knows how to communicate his thoughts and ideas as he relates his information in a reader-friendly manner, allowing even the most doubting reader to grow from the experience. Motivational books, audio tapes, and seminars are obviously inspirational and simply make us feel good. However, reading, listening or attending doesn’t necessarily insure a behavior change which is what we truly desire and often need. Andrews offers exercises, techniques and encouragement to master that challenge of actively changing attitudes and behaviors. This is a book you’ll want to keep in a convenient location as you’ll find yourself returning to it regularly for an additional dose of inspiration and guidance. This is the first of two book reviews that deal with the works of a very unique author who deals with an extremely relevant subject. Today’s worldwide environment is tremendously chaotic. Every newscast and/or newspaper presents us with a new challenge to add to a rapidly growing list of controversies we must deal with. Stress levels escalate as we contemplate the task of facing new decisions every day—many of which can be life-changing. If there was ever a time for positive thinking, this is it. However, none of us wants it shoved down our throats at a time when we have so many negatives to deal with. Enter Andy Andrews. He may have been a bit of a futurist in 2002 when he offered us a very unique blend of fiction, history, allegory, and inspiration in his wildly successful parable, The Traveler’s Gift. It’s as though he was predicting the chaotic decisions we’d be facing in 2008 while presenting a variety of tools which can be used to make those critical decisions. Rather than simply providing steps or another typical formula, Andy knows and respects the power of story-telling and therefore utilized that format by combining entertainment and education within the pages of what is destined to become a classic. If you enjoyed It’s A Wonderful Life and A Christmas Carol, you’ll want to add The Traveler’s Gift to your library of favorites. Author and motivational speaker Andrews effectively combines self-help guidelines with fantasy fiction to catch your interest and sustain momentum while simultaneously passing on excellent information that can change how you view and deal with the world, and ultimately, how the world deals with you. Many will find it easy, indeed, to identify with the hero of this compelling story, the likable David Ponder. He’s facing many of the trials and tribulations that have become commonplace in today’s challenging society. David loses his confidence and his drive to survive as events beyond his control deprive him of money and his job … so much like so many of today’s citizens facing constant chaos. With a wife and daughter to support, he becomes seriously distraught and contemplates suicide. David is rendered unconscious after a car accident and experiences an imaginary (or is it real?) journey into seven key points in history that form the bulk of the book. At each stopping point, he is met by historical figures such as Abraham Lincoln, Anne Frank, King Solomon, Harry Truman and Christopher Columbus, each of whom imparts one of the seven key decisions that the author contends are essential for personal success. We’re sometimes so overwhelmed by the volume of decisions we must face that we don’t even consider the fact that decisions can be categorized for better clarification and understanding of the choices we face. I’ll share those seven critical decisions in greater detail in the following review of Mastering the Seven Decisions. After his travel through time, David regains consciousness in a hospital and discovers he is holding letters given to him by the various heroes. The letters offer familiar self-help counsel: accept that the buck stops with you, become a wisdom seeker and a person of action, determine to be happy, open the day with a forgiving spirit, and persist despite all odds. Although Andrews writes from a Christian perspective, his overall message (trust that God is sovereign but do your part in making your future happen) will ring true with a broad spectrum of inspirational readers. Andrews does an exemplary job at providing positive suggestions for overcoming life’s obstacles. After conversations with a number of friends and associates, I found that few were familiar with this author’s previous work even though his talent is known worldwide. Therefore, I feel compelled to share a bit of his background in the hopes that you’ll want to learn even more about Andy and his influential offerings. Check out our blog for a captivating bio on this best-selling author as we have added him to our “Meet The Authors” feature. The vast majority of the books I choose to review deal with some aspect of the business world for the most obvious of reasons. However, from time to time, I like to share a book I think you might find useful or simply enjoyable in the hopes that diverting your focus can certainly serve as an asset in refreshing your mind and spirit. Therefore, when you return to your business challenges, you’re actually more productive than ever. This is one of those books you don’t necessarily have to read page by page or chapter to chapter. You can find comfort in knowing you can open the book to most any page, read as much or little as you like, and discover substance that provides a “recess” for your senses. After even a brief sampling of this invigorating content, you can return to your work refreshed, relaxed and satisfied that your time and energy was well spent. The author, Linda Solomon, is an award-winning photo-journalist and the photographer whose unique work has been featured on Good Morning America, World News Tonight, NBC Nightly News and The Today Show, as well as in galleries around the country. She’s also the photographer of The New York Times best-selling book People We Know, Horses They Love. Don’t panic if you’re not into horses. This woman focuses her talents in a variety of areas and, in this piece, she focuses on two aspects of keys. To begin, she searched the entire country to unearth a rare collection of vintage keys, nowadays considered among the most collectible of antiques. Each key protected a precious belonging … a private estate, a family’s first car, an antique clock, a treasure chest, an heirloom locket, a secret hiding place, etc. 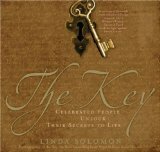 In her strange pursuit, Solomon discovered that the keys we treasure the most are actually those that bring us peace of mind. In this interesting book, the author marries beautiful black and white photographs of intricate, antique keys with words of wisdom from some of the world’s best-known entertainers, politicians, athletes, CEOs and other luminaries. Each dignitary is allotted two pages … the first is a distinguishing full-page close-up photo of a unique key, which lends credence to the words of wisdom shared on the adjoining page. Linda has always believed photography teaches us to not just look, but really see. The words engraved on keys communicate certain qualities. The key is a metaphor and, if matched with the right person, each key has a soul. It is the author’s hope that the photographs of each key will provide a different way to see the real person by opening our eyes to their words. These celebrities also share another quality—compassion—since their words will benefit the continuous research to cure breast cancer. This perfect little gift book also includes enlightening entries from famous women who have fought breast cancer and survived. Proceeds from The Key will be contributed to breast cancer research. The Key will certainly be an excellent addition to any collection of coffee table selections. You may have to search a bit to find this classic, but the effort will certainly provide great dividends. While a new copy can easily be found online for as low as $5, it may very well be the greatest addition you’ll ever find to both your business and personal libraries. In my opinion, it should be required reading for every high school student in the nation. I was first exposed to this masterpiece very early in my business career. I found it in the form of a very small booklet and must admit that the package was certainly a disservice to the wonderful gift I found within the covers of this classic. “Acres of Diamonds” was originally written and delivered as a speech and was considered by many to be one of the finest lectures ever written. I’m continually amazed by the large numbers of people I come into contact with who have read and been inspired by this book at some point in their career. My amazement may very well stem from the fact that this inspiring story was written by an author who was born in 1843 and died in 1925. Russell H. Conwell was a lawyer, a Baptist minister, a decorated Civil War officer, and founder and first president of Temple University, which opened as a college for working people in 1884. For more than 60 years Conwell was active as a lecturer. Conwell personally delivered his “Acres of Diamonds” lecture over 6,000 times and earned over $4,000,000 doing so (about $200 million in today’s dollars). The story was about a farmer who lived in Africa and through a visitor became tremendously excited about looking for diamonds. Diamonds were already discovered in abundance on the African continent, and this farmer got so excited about the idea of millions of dollars worth of diamonds that he sold his farm to head out to the diamond mine. He wandered all over the continent, as the years slipped by, constantly searching for diamonds and wealth, which he never found. Eventually, he went completely broke and threw himself into a river and drowned. Meanwhile, the new owner of his farm picked up an unusual looking rock about the size of a country egg and put it on his mantle as a sort of curiosity. A visitor stopped by and in viewing the rock practically went into terminal convulsions. He told the new owner of the farm that the funny looking rock on his mantle was about the biggest diamond that had ever been found. The new owner of the farm said, “Heck, the whole farm is covered with them”―and sure enough it was. The farm turned out to be the Kimberly Diamond Mine … the richest the world has ever known. The original farmer was literally standing on “Acres of Diamonds” until he sold his farm. This book will not appeal to those who think that one’s own surroundings offer no advantages. Acres of Diamonds offers a multitude of lessons about the rewards of work, education, and finding the riches of life in one’s own back yard. There are a multitude of gems to mine from Russell Conwell’s words, no matter what your walk of life. Acres of Diamonds remains a significant—and inspirational—lesson about where the true riches of life may be found. Today’s top business leaders work with their “inner CEO” to win big accounts, elevate productivity, increase sales and profits, resolve critical issues, and grow their organizations. That “inner CEO” is better known as intuition. As you probably know, intuition is one of the fastest spreading buzzwords in the business world today. It has become increasingly important to decision makers at every level who are inundated with an unfathomable amount of data in this technical age of instant info. Best-selling books such as Blink, Megatrends and Winning focus on the “what” of intuition. In Trust Your Gut, business consultant Lynn Robinson gives us the “how” part of accessing this incredibly valuable inner resource to make quicker, stronger, better decisions on a regular basis. A variety of “intuitive break” strategies. 13 ways to inspire creativity and intuition in your team. Why enthusiasm is a message from your intuition. The five questions to ask your intuition when you’re making a decision. The 90-second activity you must do every day to achieve your goals easily and effortlessly. How to motivate prospects to take action. How to recognize the “power hunches” that will direct you to success and add to your bottom line. Lynn Robinson, M.Ed., is one of the nation’s leading experts on the topic of intuition. She’s a popular and widely recognized author and motivational speaker who works with businesses and individuals as an intuitive consultant, providing insights into goals, decisions and strategies, and teaching the use of intuitive skills for assessment of information. Lynn is the “Life Transition Expert” and advice columnist for ThirdAge.com, the leading Web destination for baby boomers. For decades, successful leaders have recognized the fact that the gut never lies and should be believed first. They have fine-tuned this tremendous asset as they would any potential individual resource. You can and should do the same thing. What’s your “gut feeling” on that suggestion?